Going into ALAâ€™s Midwinter Meeting last month, I knew Twitter was going to play a much more prominent role than it had in the past. Itâ€™s been used heavily at other librarian conferences, but usually in a more social way or as commentary on content during the event. However, Midwinter is a different beast, as itâ€™s primarily a business meeting for the Association, so I wondered how much of that work would happen on Twitter this time around. Most of the people on ALAâ€™s staff, like most people anywhere, have never heard of Twitter, let alone used it, so I wanted to give them a heads up in case it came up in meetings or in conversations. A couple of years ago, the IT department at ALA implemented monthly update meetings open to all staff, and since we had one scheduled right before Midwinter, I took advantage of the opportunity to highlight Twitter, what it is, and how a few units are using it. And then we all headed to Denver. And wow did Twitter play a big part. Kenley Neufeld sums it up pretty well, and even notes how fun the experience was. If you had asked me, I wouldnâ€™t have predicted that four councilors would tweet from the floor during council sessions, thereby providing an effective, real-time transcript of what was happening. Even beyond that, though, I got to participate in meetings I wasnâ€™t physically at (from within other meetings), as did people who werenâ€™t even in Denver. And good things came from all of it (including a helpful guide for what *not* to do). So when we got back, I decided to do a presentation at the February ITTS Update meeting about Twitter on ALA. Not ALA on Twitter, but Twitterâ€™s effect on the Association and the story of Midwinter that Twitter produced. Luckily, many of the people who tweet about us have a sense of humor, so there were some good laughs in the screenshots, especially about our content management system (Collage). So thank you to everyone who publicly tweeted about us in January, especially at Midwinter, because you helped me illustrate a moment in time when something changed for ALA. I definitely think communication and conferences will never be the same for our organization, and Iâ€™m fascinated to see where this all leads. For the last month, thatâ€™s how Iâ€™ve felt at ALA. Units are moving faster than I can, and several have started new Twitter accounts. On the one hand, huzzah! On the other hand, theyâ€™re flying a little blind (so please cut them a little slack while they get their Twitter sea legs). Since I really donâ€™t have time to do training right now, I wanted to pull together a few resources to point my co-workers to until we can do something more formal. Iâ€™m also including some explanations for how I track ALA on Twitter in case others want to try these strategies, too. Since I think it could be useful to others, Iâ€™m posting the list here, rather than just sending the information out in an email to staff. If you have additional suggestions, please include them in the comments. Make sure you read up on some of the best practices for using Twitter. There are many out there, such as Twitter 101: 8 Tips to Get Started on Twitter and How to Succeed at Twitter. At bare minimum, make sure you add an avatar and fill out the bio section, including a link back to your website. 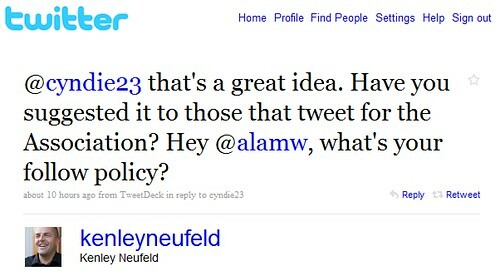 I use Twitter personally, and I use the ALAannual and ALAmw accounts for work. Itâ€™s not easy to track two accounts throughout the day. So hereâ€™s the routine Iâ€™ve established to this point. First thing in the morning, I search Twitter for references to ALA. If itâ€™s something I can respond to, I do. If itâ€™s not something in my area (IT), I pass along the information. I use TweetDeck to try to track my Twitterstream throughout the day. Itâ€™s easily the best tool Iâ€™ve found for two reasons. First, it lets me set up different groups of people Iâ€™m following, so Iâ€™ve set up a group showing all the ALA Twitter accounts and another of friends I want to track more closely. Second, it lets me do a search within groups by filtering for a term. So a couple of times a day, Iâ€™ll filter everyone Iâ€™m following for the term â€œALA.â€ I can usually get a heads up about anything major just by doing this. At the end of the day, I do another search of Twitter just to make sure I havenâ€™t missed anything. ALA staff, if you want to try TweetDeck, I think ITTS will have to install it for you, so contact us to request an install. There’s also a helpful video explaining How to Tweetdeck Like a Pro. I have a NetVibes page set up to track ALA as a term across multiple sites. For example, the Twitter search appears here, although I donâ€™t find it as easy to scan as the list on the Twitter site or in TweetDeck. But I also have RSS feeds from news sites and FriendFeed displaying on this one page, so it can be handy for a quick scan. ALA staff, if you want help setting up something like this for yourself, please let me know. If you have a blog or other useful, not overwhelming RSS feed, use TwitterFeed to automatically have notifications of new items sent to Twitter. If youâ€™re not using TweetDeck to automatically shorten URLs, you can use TinyURL or is.gd. A URL like http://www.ala.org/heading/subheading/anotherheading/anothersubheading/title/index.cfm should *never* appear in a tweet. As I was getting ready to hit the â€œpublishâ€ button, I saw Phil Bradleyâ€™s post about CILIP and Twitter (or lack thereof). It made me realize how far ALA has come, and how lucky I am to work in an environment where Iâ€™m allowed to experiment in these spaces and help integrate them into the Association. I live in a really special place right now, both professionally and personally, and I donâ€™t take that for granted.